Why not enjoy an intimate, cozy meal with one of our solid wood corner breakfast nook sets? 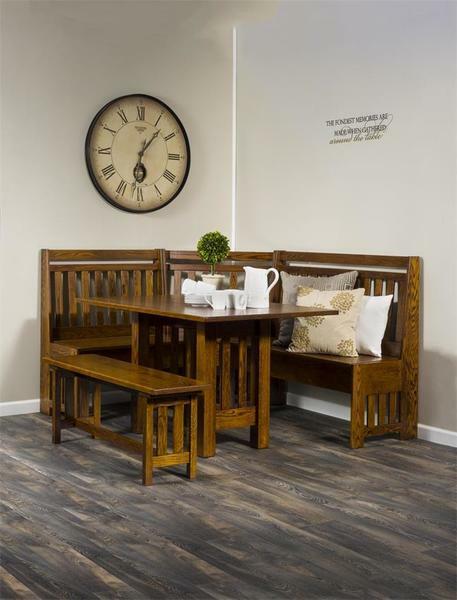 This beautiful breakfast nook set is proudly made in Indiana by an Old Order Amish craftsman. This furniture can be customized to fit your kitchen corner and will be ideal for entertaining and casual family meals. Take advantage of those unused kitchen corners with a new beautiful breakfast nook set custom made for you. This Amish breakfast nook set includes all five pieces shown but can be split it if you desire. All of our breakfast nook sets and kitchen nooks with storage can be customized to your dimensions. Call one of our Amish furniture specialists today for a custom furniture quote, to receive finish samples or to place your order over the phone for this Bay Hill Slat Nook set. Our Amish Valley Collection specializes in making solid wood benches and kitchen nooks. You can't get a better quality breakfast nook set than our Solid Wood Breakfast Corner Nook Set with Storage. This attractive mission style breakfast nook set will bring style into your kitchen. Choose your hardwood and finish to customize the breakfast nook set to match your kitchen cabinets. We are happy to provide your with stain samples to help you create that custom look. The two wall benches have 6" inside storage and the lid also has a soft close support so that fingers don't get pinched. Some easy assembly is required. Custom Sizes and Individual Pricing is Available Upon Request. We use the breakfast nook in our kitchen, which has a narrow eating space. The nook fits perfectly while being sturdy enough to withstand this high traffic area. I love the storage.